In Week 13 of Monday Morning Locks, Alex Sibley predicts the winners of the Final Four, plus offers his take on LeBron's second visit to Cleveland. Things are back to normal for this sports writer. After a horrid stretch that saw me win just three picks in two weeks, my ever-so-trustful number of 3-2 is back, and hopefully, the winning ways are as well. The my first of two losses came when Jimmer Fredette and the BYU Cougars fell to Florida, while No. 2 came my way thanks to the Kentucky Wildcats, who shocked the nation and upset Ohio State. Other than that, the Otters took care of business in Game 1 against the Windsor Spitfires, while Kemba Walker once again led the UConn Huskies to a victory over Sad Diego State. Win No. 3 was huge, as I took the most heat I've ever taken since this column has begun. I got a litter of text messages that were none too kind. To make it simple, people thought I had finally lost it. But my Butler Bulldogs, yes, they're my team when they're winning, upset Big Ten power Wisconsin to advance to the Elite Eight. I will take the high road and not gloat. I was always confident with this pick, as I have a soft spot in my heart for Cinderella this time of year – they make the tournament a worth watching. But I do have to give a shout out to a certain Mr. Ian Welsh. In the words of Will Hunting, how do you like them apples? Anyways, let's get it going as my confidence is soaring right now thanks to Butler, who will be my first lock in Week 13. Let's be honest, who didn't see this matchup coming when you filled out the Final Four portion of your bracket? Actually, if you knew what VCU stood for, you get an 'A' in my book. But like it or not, Saturday's first game to see who will take one of the slots in the National Championship Game will either be Virginia Commonwealth or the aforementioned Bulldogs. This game is so hard to pick because honestly if you look at the field, neither one of them should have made it this far. Cinderella's sister came to play this season and she resides in a beautifully decorated VCU dorm. They both do all of the little things right that win ball games this time of year. They can shoot in the clutch, grab offensive rebounds, and neither one of them has the word 'quit' in their mindsets. But I like the experience Butler brings to the table. Last year, they made it all the way to the big game. They know how to play under pressure and with the whole nation watching. VCU could let the nerves rattle them, as they have never been this far. Heck, half the team didn't even watch the selection show because they figured they wouldn't get in. Nerves will play a big factor in this one, so I'll take Butler. All good things have to come to an end. Walker has led UConn to an improbable Big East Championship and has continued his great scoring spree throughout the NCAA Tournament, including 20 against Arizona to spring the Wildcats into the Final Four. 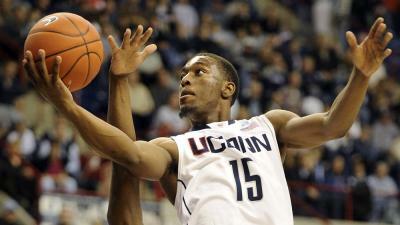 He's done everything buy fly the planes and drive the buses for UConn the last two months. But he hasn't faced a team with the swagger like Kentucky in the tourney. After beating No.1 Ohio State then No. 2 North Carolina, this young Kentucky is soaring into Saturday's contest. Kentucky is a young team – one senior, three juniors – that raises its game against good opponents. Just ask the Buckeyes and Tar Heels. More importantly, they just never seem to get tired. The Huskies have played a lot of basketball over the last month, and I may be the only to say this, but I think Walker is gassed. They have some time to rest the legs and pound Gatorade, but the hot team this time of year always seems to have that extra jump, and that's Kentucky. They have taken down a No. 1 and a No. 2, and Saturday, they will add a No. 3 to the kill list. Dan Gilbert hasn't had much of anything since his Cleveland Cavaliers lost LeBron James to the Miami Heat over the summer. On Tuesday, he should be able to muster a little grin, as the Quicken Loans Arena should be filled to the rafters as James and the Heat make their second and final visit to Cleveland. But the small, half-hearted grin will fade once the game starts. It's simple; it's the Heat playing the Cavs. Ladies and gentleman bust out the visors, sun screen and your peanut-eating pants because baseball is officially back. The Pirates, who without looking, I'm pretty sure haven't had a winning season since Taft was in office, will start 2011 Friday against the just-as-terrible Chicago Cubs in game 1-of-162. Trust me folks, these two will battle all season for the cellar of the National League Central. I've heard a lot of talk saying that the Bucco's could compete this season with all the young talent they have. Hasn't that been the case the last 10 years? That garage sale they had a couple years when they traded pretty much the entire roster and the Allegheny River hasn't panned out like it was supposed to. But you know what, they won't be over .500 a lot this season-- neither will the Cubs for that matter. Give me Pittsburgh, so all the fans can have some false hope early on this season. This one is easier than the Miami-Cleveland game. The Philadelphia Phillies and the pitching rotation that God himself carved out start the season as well Friday afternoon against the Houston Astros. Roy Halladay gets in the nod on the mound. Enough said. ~Alex Sibley covers sports for the Erie Reader. You can contact him via e-mail at ASibley@Eriereader.com, or follow him on Twitter @ErieReaderSport.